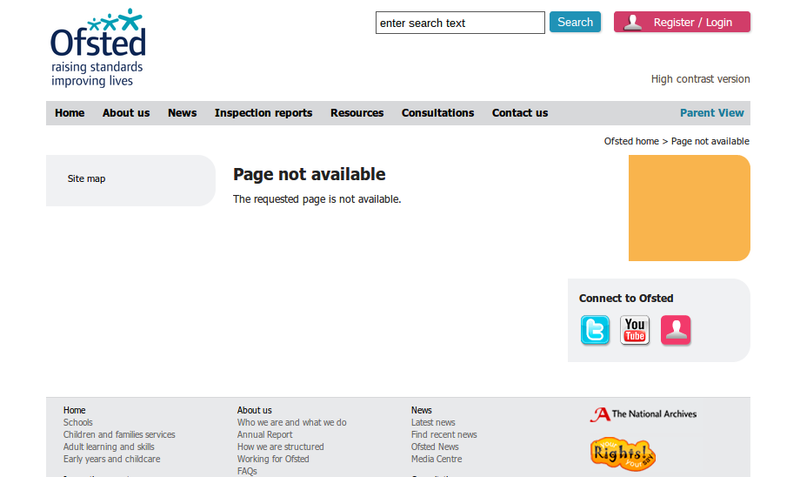 Did OFSTED just remove those good practice videos? As you may recall, my last blogpost (and the one before it) highlighted how OFSTED good practice, as featured in a series of youtube videos, tended to either include, or largely consist of, trendy, dumbed-down nonsense. The best bits included a teacher explaining how flip-cameras are “essential” for English departments and maths teachers explaining how they wouldn’t dream of telling kids how to work out answers to maths questions. They’d been up for several weeks. It seems a bit of a coincidence that they should go right after I had drawn attention to them. 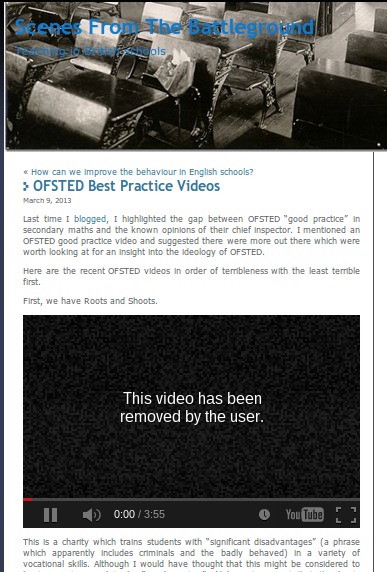 I don’t want to take credit for a technical error, or a coincidence, and I’ll delete this post if somebody can come up with an alternative explanation, but I think I may have just embarrassed OFSTED to the point where they have had to edit their website and youtube channel. Excellent. Who oversees these videos? Vitally important that Ofsted doesn’t head the mish-mash, dumbed down, content free, knowledge-debased curriculum that’s blighted education. If it is in response to this blog then I suddenly have a lot more respect for them. I hope they did – Flip cameras ‘essential’ Ha! Obviously not, and, in any case, advertising a product that is no longer being made. Well done for pointing this foolishness out.